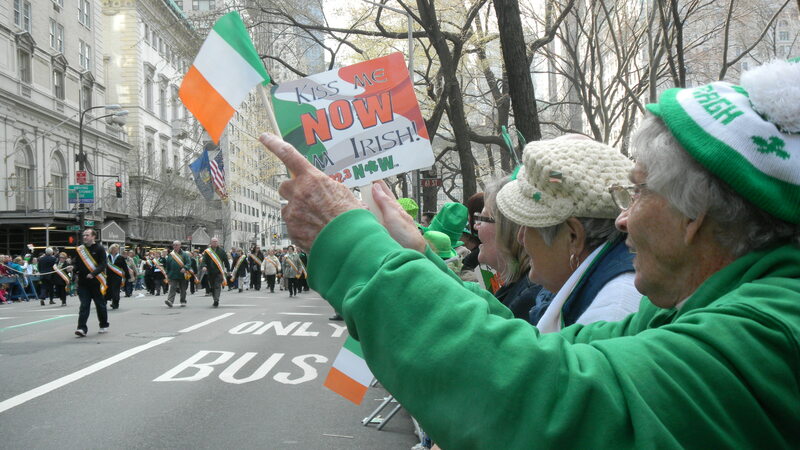 This past weekend I had the chance to go down to New York City for the St. Patrick’s Day celebrations. The great weather combined with a weekend holiday made for a huge crowd. Over two million people lined 5th Avenue to watch more than 150,000 people march in the 251st annual parade. Leaving aside for the moment the very important questions over who is (not) allowed to participate in the parade and the militarization of the event, I was struck by two powerful aspects of St. Patrick’s Day that go far beyond caricatures of drunken parting and dyed “milk”shakes. Watching the parade one is struck by the contribution of immigrants to the building of New York and the United States. This is indeed something to celebrate. Coming from poverty and discrimination, Irish-Americans—like so many other groups—came to the United States and helped to transform our culture and nation. But I could not help but wonder as I watched the parade how those celebrating Irish migration and St. Patrick (who himself was an unwanted migrant) are responding to the current social and political debates about immigration. How do we look upon those migrants who are coming to the United States today from Latin America, Asia, and the Middle East? Like my Irish great-grandparents, these communities are held as suspect and seen as being un-American (think of the continued profiling of Muslim-Americans). In Scripture, we can see that this pattern is not entirely new. Like many privileged Irish-Americans, Israelites needed reminding of the ethical demands to attend to the needs of the poor: “Do not exploit the lowly and the poor daily-wage earner, whether he be one of your brothers or a foreigner…Do not violate the right of the foreigner …Remember that you were a slave in Egypt and Yahweh, your God, rescued you. This is why I command you to do this” (Deut. 24). I was also struck by the counter-cultural aspects embodied by the different social groups marching. While much of St. Patrick’s Day has been commercialized and reduced to drinking, the core of the parade remains people and social communities including Catholic schools, parishes, benevolent societies, service organizations, labor groups, and other associations. The sheer number and presence of these very different communities speak to a rich social fabric of service, relationally, and social consciousness. But as we also see in the parade, the Irish-Catholic commitment to service and community has not been limited only to the non-governmental sector. Millions of Irish-Americans have contributed much to the development and strengthening of groups that might be seen as offering “socialized” services including fire men and women, police officers, emergency medical services, transportation workers, sanitation workers, and politicians. While there is a push in politics today to privatize some of these services and belittle governmental workers, the parade rightfully honors public service. Strikingly and positively, there are no for-profit corporations that march in the parade. Patrick was a missionary and there is definitely something missiological about those socially engaged groups represented at the parade. Although St. Patrick’s Day has been commercialized, there are ways in which we can reconsider and reclaim the social, ethical, and theological significance of these celebrations for the future.